The library at Sacra­men­to State boasts a fea­ture which is, I believe, unique among Amer­i­can aca­d­e­m­ic libraries: a Japan­ese tea room. The Sokiku Nakatani Tea Room, which was ded­i­cat­ed in 2007, was the gift of an anony­mous donor and is named after a long-time Sacra­men­to-area prac­ti­tion­er of Cha­do (more on this term soon). The tea room sits in the library’s base­ment, with win­dows look­ing out onto a small adja­cent gar­den that is clev­er­ly tucked away from the hus­tle and bus­tle above. In addi­tion to hous­ing a col­lec­tion of tea ware and tea prepa­ra­tion uten­sils, the tea room peri­od­i­cal­ly hosts tea cer­e­monies — more than twen­ty just this semes­ter. The room itself is small, but it has been clev­er­ly con­struct­ed as a two-walled room-with­in-a-room to allow larg­er groups to par­tic­i­pate in the cer­e­monies. Closed-cir­cuit cam­eras and flat screen TVs even pro­vide close-up views for those seat­ed in the back rows. It just so hap­pened that one of this semester’s tea cer­e­monies fell dur­ing our usu­al week­ly reed/studio class time. I reserved spots for myself and my stu­dents and we took the week off from form­ing and scrap­ing to learn about tea instead. Our ses­sion began with Christie Bartlett of the San Fran­cis­co Urasenke Foun­da­tion explain­ing the his­to­ry of the tea cer­e­mo­ny. Its ori­gins are in Chi­na in the 8th cen­tu­ry, but it spread to Japan in the 9th cen­tu­ry and was refined and ele­vat­ed to an art form in the 12th through 16th cen­turies. 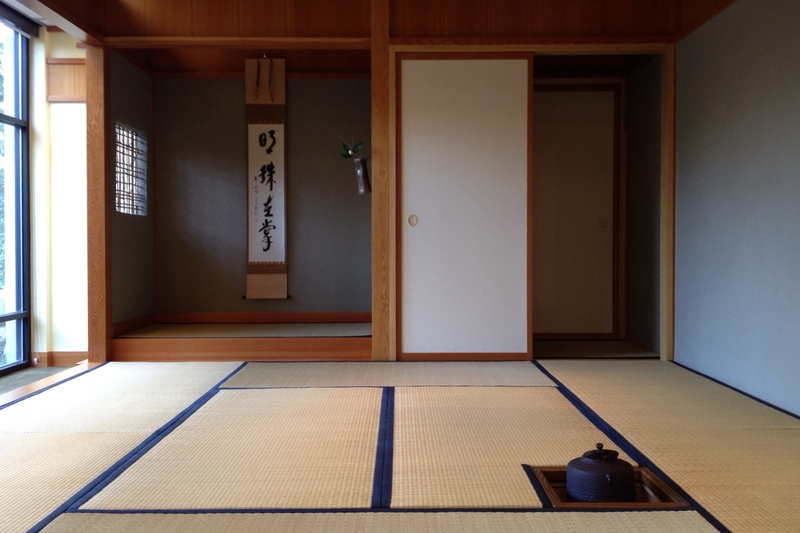 She also explained that the term Chanoyu (also Cha­do) is often trans­lat­ed as “tea cer­e­mo­ny,” but a more cor­rect ren­der­ing in Eng­lish is “the way of tea.” This reflects the influ­ence of Zen Bud­dhism on its devel­op­ment — the cer­e­mo­ny itself has more to do with phi­los­o­phy than mere pro­ce­dure. Every aspect of the cer­e­mo­ny is high­ly for­mal­ized. The guests enter the tea room one-by-one, scoot­ing in through the tra­di­tion­al­ly small door — every­one, no mat­ter his or her social or polit­i­cal stand­ing, must kneel to enter. The guests make two stops inside the room before set­tling down. The first is in front of the tokono­ma, a small alcove in which are dis­played a cal­li­graph­ic scroll and a sim­ple flower arrange­ment. The sec­ond is at the hearth, in which the tea water is heat­ed. Once the guests are set­tled, the host enters, and the cer­e­mo­ny prop­er begins. Each per­son involved is respon­si­ble for doing or say­ing cer­tain things, but the host and the first guest have the most involved roles. The host pre­pares the tea in a very pre­cise, inten­tioned, and prac­ticed way. Every motion is well thought out and effi­cient. Econ­o­my of Motion - Our host moved exact­ly as much as nec­es­sary to com­plete each action — no more, no less. 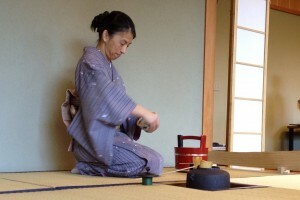 Mind­ful­ness and Focus - As she pre­pared the tea, our host gave her full atten­tion to what she was doing. Nar­ra­tion and ques­tions were han­dled by Ms. Bartlett. Our host did speak to us, but always in between batch­es of tea. Exe­cu­tion - It was very clear that our host was extreme­ly prac­ticed in her motions, and exe­cut­ed them exact­ly the same way for each of the four batch­es of tea she pre­pared. Econ­o­my of fin­ger motion is cer­tain­ly essen­tial to a flu­id bas­soon tech­nique, and we should of course strive to always con­cen­trate on what we are play­ing. But I think that the last of these qual­i­ties — pre­ci­sion of exe­cu­tion — has the most to teach us about per­form­ing. One action in par­tic­u­lar impressed me quite a bit. At a cer­tain point dur­ing the prepa­ra­tion of each bowl of tea, our host would use a small fold­ed cloth to wipe the rim of a the tea bowl. Once she had done this, she would set the cloth (rather thick when fold­ed) on the slant­ed lid of the tea pot, itself perched on top of a small cylin­der (seen to the left of the ket­tle in the above pho­to). Even though the lid was sloped at a steep angle and was bare­ly wider than the cloth, she nev­er moved ten­ta­tive­ly or had to make any adjust­ments to keep the cloth from falling off. She sim­ply set it on its seem­ing­ly pre­car­i­ous perch and moved on. To my way of think­ing, this is exact­ly how we should per­form a dif­fi­cult musi­cal pas­sage — with inten­tion, con­fi­dence, and plen­ty of prepa­ra­tion. We can’t gin­ger­ly approach the high C that opens Stravinsky’s Rite of Spring, nor can we stop to make adjust­ments to our reed or our fin­ger­ing once we’ve start­ed play­ing it. Our prepa­ra­tion has to be so good that we can sim­ply place the C on its perch, just like the tea cloth, and then move on. But beyond the actions involved in prepar­ing tea, I believe that the phi­los­o­phy of the cer­e­mo­ny has some­thing to teach us musi­cians, as well. This les­son is nice­ly encap­su­lat­ed by some­thing Ms. Bartlett said after we had con­sumed our tea: “The tea cer­e­mo­ny is not about drink­ing green liq­uid.” That is, prepar­ing and drink­ing tea is not the point. Rather, the way of tea is about peo­ple com­ing togeth­er to step away from the con­cerns of the world, appre­ci­ate the beau­ty of sim­ple actions and ordi­nary things, and to talk with each oth­er as equals about beau­ty, art, and the like. I see in this a strong par­al­lel to the rit­u­al of rehears­ing and per­form­ing in a musi­cal ensem­ble. To para­phrase: “Play­ing in an orches­tra is not about oper­at­ing the bas­soon.” Between reeds, fin­ger­ings, and dif­fi­cult musi­cal pas­sages of all kinds, it’s easy to focus on the act of just mak­ing our instru­ment func­tion. But our real pur­pose for being there is to con­nect with our fel­low play­ers and to make music. If we lose sight of this, we can’t ever reach our full poten­tial as per­form­ers. These are my ini­tial impres­sions, but the cer­e­mo­ny gave me and my stu­dents plen­ty on which to rumi­nate. I think it’s very help­ful to have a some­thing com­plete­ly out­side the realm of music to use as a frame of ref­er­ence for how we approach play­ing the bas­soon. Because we had such a good time and got so much out of the expe­ri­ence, I think I’ll make attend­ing a tea cer­e­mo­ny an annu­al CSUS Bas­soon Stu­dio event.